Health, lifestyle, About Disease, festivals, sports, current affair, news, history and some other material. Uses, Health Benefits, And Side Effects. Papaya is a soft fruit with a yellow and orange type of color. You may eat both type of papaya either it is ripe or unripe it depends on persons taste. Unripe papaya is used in form of vegetable and ripe papaya is used in form of fruit. Papaya is delicious fruit and this fruit is available in market all over the year. It gives us all nutrients and medicinal benefit. Many people like to eat papaya after breakfast and lunch. Papaya is helpful in digestion of our food but sometimes it also gives digestive stress if it is taken in excess.so we can also say that it also leads to digested issues. Papaya pulp is also used in making shampoo and facial cream. Ø Scientific Name of Papaya- Carica Papaya. 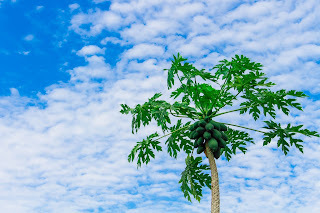 Ø Common Name of Papaya- Pawpaw and Melon tree. § A great person Christopher said that Papaya is “The fruit of the Angles”. Papayas are usually grown from seed, their development is very fast. Its seed are generally cultivated and grown. It can be easily cultivated in any type of clay and area. It grows in tropical climate. Its origin location is in Central America. In now a days Hawaii is the only U.S state to commercially produce Papaya. Most papayas are either from Hawaii or Mexico. Papaya grows naturally in Caribbean and Florida too. Today Papaya is cultivated throughout the tropical world and into the warmest part of the subtropics. § It is good for diabetic patient. § Eating papaya daily helps in tooth pain and swelling problem. § Seeds of papaya protect from kidney failure. § Papaya is also very helpful in increasing platelets when you are suffering from Dengue. The juice of leaves of papaya is very good for increasing our platelets in Dengue. Papaya leaves extracts boosts as well as regenerate the platelets and white blood cells. Papaya has some natural ingredients including the vitamins A, C and E which supports the immune system. 1. Eating too much papaya can cause skin discoloration due to high value of carotene. 2. Eating too much papaya during pregnancy can harm women and his baby. 3. Papaya may give rise to respiratory disorders. 4. Papaya can cause kidney stones development. 5. Papaya may develop skin Rashes. 6. Papaya may slow down our heartbeats. 7. Papaya may cause constipation. Best captions for selfie of facebook and instagram DP.